Yes, upgrading your Mac OS will stop the constant notifications from Apple to update, but they are many other valid reasons to download macOS Sierra on your qualified Mac. Siri is now on the Mac in macOS Sierra. The round blueish circle at the top right of your Mac is a direction connection to your own personal assistant. Just click on it and begin talking. If you ask for directions, she will even tell you if you have to enable location services or change the status of anything else that will prevent her from completing your request. In macOS Sierra, Siri can search the web and the files on your hard drive. You can even search for specific key words. For example, you can ask Siri to search for any files containing “Fix Apple Now” and a list of relevant files will be displayed. You can drag those results to into a window or application on your desktop. 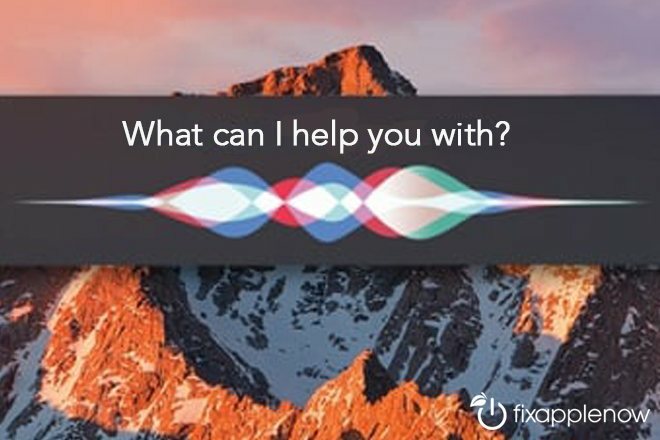 Siri also works with Apple applications such as iTunes, Maps and the Apple Mail app that are native in Sierra. Many of the Siri features on Apple’s iOS are the desktop version. There are also new Siri features designed just for the desktop in macOS Sierra. Requests can even be edited by the double-clicking the words in the Siri window. Making memories is easier than ever in macOS Sierra. The new Memories tab automatically used events, places and people to create slideshows. In macOS Sierra, you can add annotations to pictures using a feature called Markup in Photos. When editing photos, choose Extensions, then Markup to add text and shapes to the images. The advanced editing features also means that you have the ability to edit Live Photos. The Photos app in macOS Sierra has also received a tech upgrade, with increased smart search capabilities and improved face recognition. Picture in Picture (PiP) is another new feature in macOS Sierra. In PiP, a small video window is displayed that remains visible and open even if you switch apps. In order for PiP to work with web videos, the must use an API provided by Apple. It is easier than ever to work across multiple Apple devices and applications. There is now a Universal Clipboard that exists between iOS 10 and macOS Sierra. Users can copy and paste from an iPhone to a Mac and a Mac to an iPhone, if the devices are using the same Apple ID. On newer Macs with macOS Sierra, there is a new Auto Unlock feature that allows users to bypass the Mac login by using the Apple Watch. In Sierra Apple’s standard apps can utilize tabs, rather than windows, to manage multiple documents. This feature is supported by Apple Mail, Maps, TextEdit, iWork (Pages, Keynote and Numbers) and some third-party apps. To use tabs, merge two or more open windows of the same app by selecting “Window”, “Merge All Windows” to combine them into a single window. The optimized storage feature in macOS Sierra helps users clean up the drive by deleting unnecessary files and moving others to the cloud. Free space on a Mac by choosing “About This Mac” and opening “Storage” tab and “Manage” to choose options of the feature. Before updating to macOS Sierra, it is a good idea to make a current backup using Time Machine. Also, be sure you don’t have any crucial programs or applications that will no longer be compatible with the upgraded OS. If you would like help with backups, updates or anything Apple, contact Fix Apple Now.